I'm fascinated by the sheer variety of packing puzzles. The possibilities are near infinite when it comes to designing a packing puzzle. Your imagination is the limit. No wonder then that Jürgen Reiche, from Siebenstein-Spiele, makes so many of them, as his imagination is apparently limitless. Proof of that is his latest design Mit Schwung. 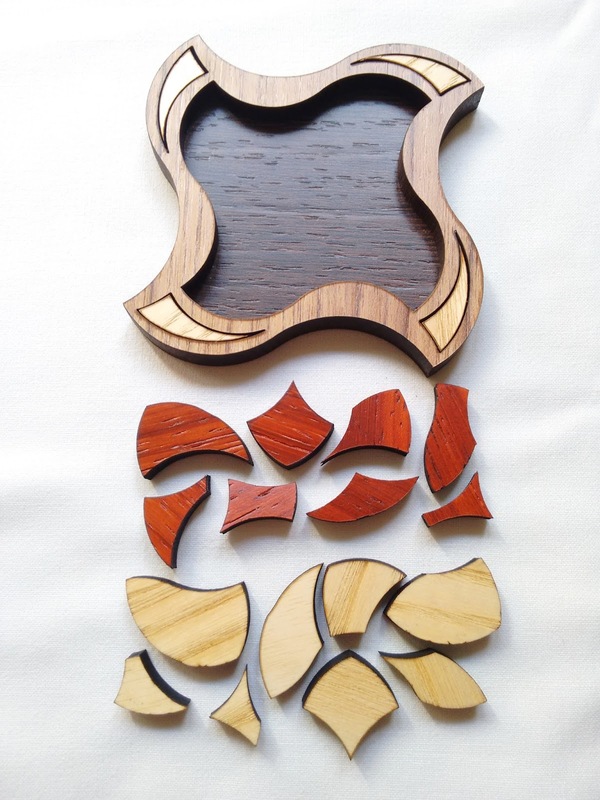 A gorgeous and mesmerizing little packing puzzle that looks harder than it actually is. This is a puzzle that is cheap and easy to produce, because it uses laser-cut wood, but it's also quite versatile. The designs you can do with this type of material can be much more detailed and precise. 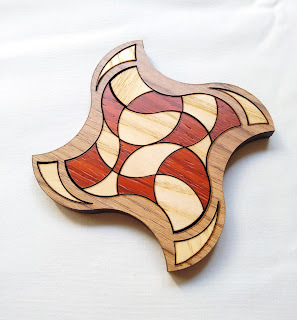 The results are stunning, as you can see, with a pattern that is not only great to look at, but also interesting to solve, because of the irregular pieces. Sixteen round pieces make this impressive checkered design. The corner pieces in the frame are not part of the puzzle, since they're glued in place. It does make a nice effect, though. The shape of the pieces and the decision to make the design with checkered or contrasting colors makes a big difference between an otherwise bland puzzle and a great-looking puzzle. This proves that you not only need a good design, but also a nice presentation. This is a difficulty level 5/7, rated by the manufacturer, but I'm not sure it's that difficult. Because you have a checkered pattern, no two identical colors are touching, which is going to simplify your options when trying to solve it. Each piece can be flipped on either side, so it does add some difficulty, but ultimately a very enjoyable and moderately difficult puzzle. Mit Schwung is a beautiful and unique puzzle, filled with character. The design is complex enough to produce a great effect with a pattern that looks simple and yet fascinating. It's a great decorative object, but even more satisfying as a puzzle. Availability: Mit Schwung is available at PuzzleMaster for just $17.99 CAD. Check out others designs by Siebenstein-Spiele. For an even wider variety, check out the packing puzzles section.